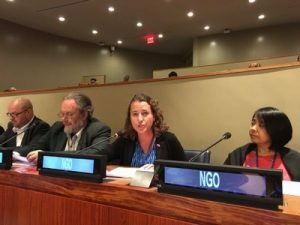 Emily Welty, director of Peace and Justice Studies at Pace University, delivers a statement at the UN General Assembly First Committee in October 2016. As Vice Moderator of the World Council of Churches Commission of the Churches on International Affairs, she has mobilized faith communities to participate in ICAN’s Nobel Peace Prize-winning advocacy. “ICAN’s Nobel Peace Prize is a vindication of an approach to global peace and security that centers on human rights, humanitarianism and the environment, on the people most affected by violence,” said Bolton. “Nuclear weapons use and testing has had catastrophic humanitarian and environmental consequences. The horrifying record of accidents and close calls show that there are no safe hands for nuclear weapons. ICAN showed the way that – like other weapons of mass destruction and inhumane weapons – nuclear weapons should be banned. The nuclear weapon prohibition treaty is the most significant shift in nuclear politics since the end of the Cold War and it is wonderful that the Nobel Peace Prize recognized the thousands of people around the world who made it happen.” Bolton participated in a press conference a year ago with the ICAN director at the UN Correspondents’ Association. Terrie Soule and Sydney Tisch are juniors at Pace University majoring in Peace and Justice Studies, housed in Pace’s Dyson College of Arts and Sciences, and just two of about 20 students who have been involved in this disarmament work. They are interns at the World Council of Churches, an ICAN partner in nuclear disarmament. The students made advocacy calls to all of the diplomatic missions who had voted in favor of the treaty at the negotiating conference this summer and urged states to sign and ratify the treaty when it opened for signature on September 20. 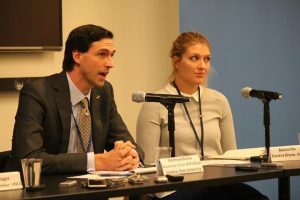 Beatrice Fihn (right), executive director of the 2017 Nobel Peace Prize recipient ICAN, with Director of Pace University’s International Disarmament Institute Matthew Bolton (left) at a press conference at the UN Correspondents Association in October 2016. Welty and Bolton are a married couple who teach at Pace and made a conscious decision together to devote their lives to promoting peace and disarmament. Their life’s mission was featured in a video this year when they were nominated for a national Jefferson Award. Pace University was featured in the former UN Secretary General Ban Ki-moon’s report on disarmament and non-proliferation education in August 2016, recognizing Pace’s “growing role in disarmament education”, highlighting the Model UN program, the Peace and Justice Studies major, research by Pace faculty, Disarmament Forums hosted at Pace, and a UN-funded project providing training to East African officials on the Arms Trade Treaty. 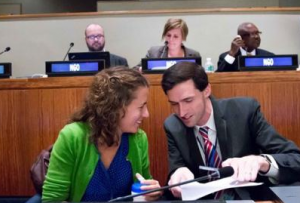 Pace University student Rachel Salcedo and Welty contributed recently to multilateral disarmament discussions in addresses to the United Nations General Assembly. Pace University professors Emily Welty and Matthew Bolton engage in advocacy at the United Nations. “The ban on nuclear weapons is so important because it is a huge step towards a more safe and peaceful world,” said Soule. Welty’s work with the campaign was profiled here. Bolton writes regularly about disarmament and the nuclear weapons ban treaty on his blog. He also wrote a brief guide to the new treaty. They both contributed to a Special Section of the journal Global Policy on the process leading to the ban, telling the ICAN story and the role of faith groups. About Dyson College of Arts and Sciences: Pace University’s liberal arts college, Dyson College offers more than 50 programs, spanning the arts and humanities, natural sciences, social sciences, and pre-professional programs (including pre-medicine, pre-veterinary, and pre-law). The College offers access to numerous opportunities for internships, cooperative education and other hands-on learning experiences that complement in-class learning in preparing graduates for career and graduate/professional education choices.